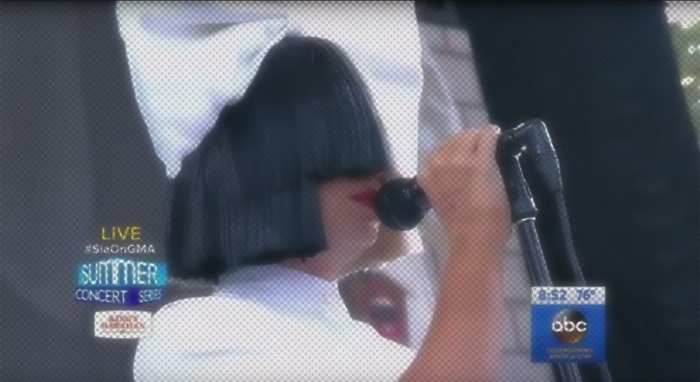 Diva Devotee: Sia's Voice Craps Out During GMA Performance Of "Chandelier"
Sia's Voice Craps Out During GMA Performance Of "Chandelier"
Sia isn't a confident performer- despite what she projects. The songwriter extraordinaire- who is currently celebrating her first Hot 100 #1 (yay, her)- has even gone as far as to say she hates singing in front of crowds. So why continue to go through the torture of performing at all? Because of the fans, apparently. Bless. With this understanding, could her MIA vocals during Chandelier at Good Morning America be the fault of nervousness? In the interview that followed the disastrous showing, Sia did reveal she'd been in tears backstage, stressing over hitting the song's textured belts. Clearly something was up. But what with a previous microphone feed suggesting she has lipped the highs before, it does leave me wondering why she didn't do the same here. Whatever the case, let's not get ahead of ourselves. This voice is not the product of studio magic. We can watch some other mic feed videos to see she can sing Chandelier live. This was most likely a bad vocal day. Happens to the best of them...except Beyonce. Seriously. I can't find any vids of her in bad voice.